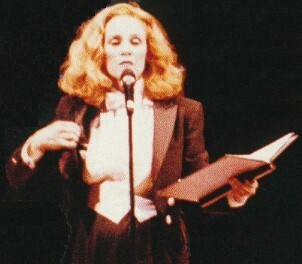 Madeline Kahn is Cora Hoover-Hooper in "Anyone Can Whistle"
A Carnegie Hall concert performance of Stephen Sondheim's 1964 Broadway musical "Anyone Can Whistle." Madeline sings the role of Mayoress Cora Hoover Hooper, who, with the help of her cabinet, fakes a miracle to revive her ailing popularity as well as that of her town. She encounters opposition from Nurse Fay Apple (Bernadette Peters) of Dr. Detmold's Sanitarium for the Socially Pressured, and asks help from Dr. J. Bowden Hapgood (Scott Bakula) only to be upstaged by him. I have listened to this CD over and over again... it is excellent. Madeline has many great songs here: "Me and My Town," "A Parade in Town," "Miracle Song," "I've Got You to Lean On," "Cookie Chase," and her final song in the concert, "There's Always a Woman," a duet with the lovely and talented Peters. This is one of my favorite CDs.